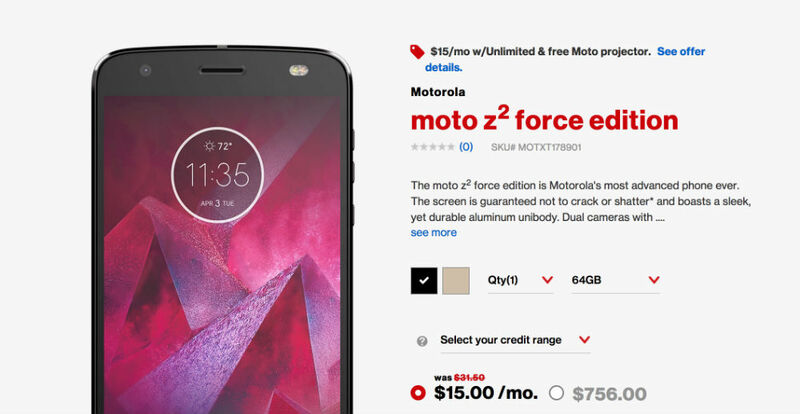 Jumping the gun just a tad, since the official unveiling event has yet to start (11AM Eastern this morning), Verizon has posted the Moto Z2 Force up for pre-order on its website, including all of the specs for the device, too. As listed, the Moto Z2 Force features a 5.5″ QHD display with ShatterShield, Snapdragon 835 processor, 4GB RAM, 64GB storage, 12MP dual rear-facing cameras, 5MP front-facing camera, microSD support, and 2,730mAh battery. As you might’ve noticed, the big changes are the dual cameras and the much smaller battery, shrinking from last year’s 3,500mAh size. As for pricing, Verizon lists it for $15/month or $756 outright. For colors, you can find it in Black or White/Gold. If you do order this device, Verizon says you can expect it to ship starting August 10. We’ll be at Moto’s event this morning to bring you the hands-on goodness!